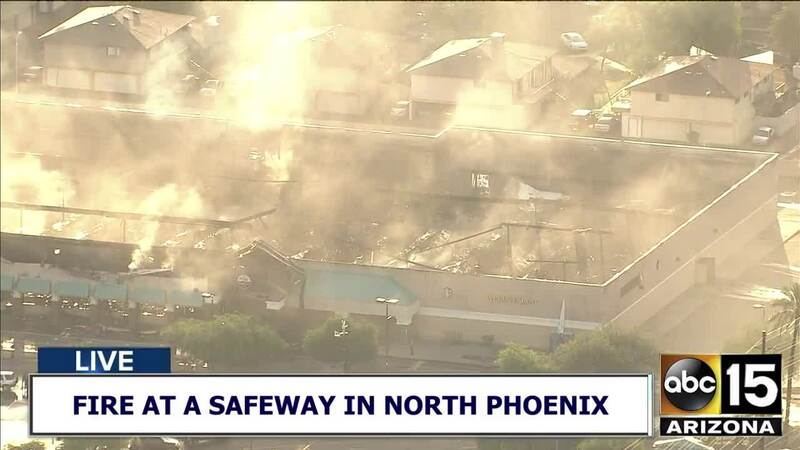 A massive three-alarm fire destroyed a north Phoenix Safeway on Wednesday evening. The fire was first reported in a back room of the store near 35th and Northern avenues just after 6 p.m. on Wednesday. 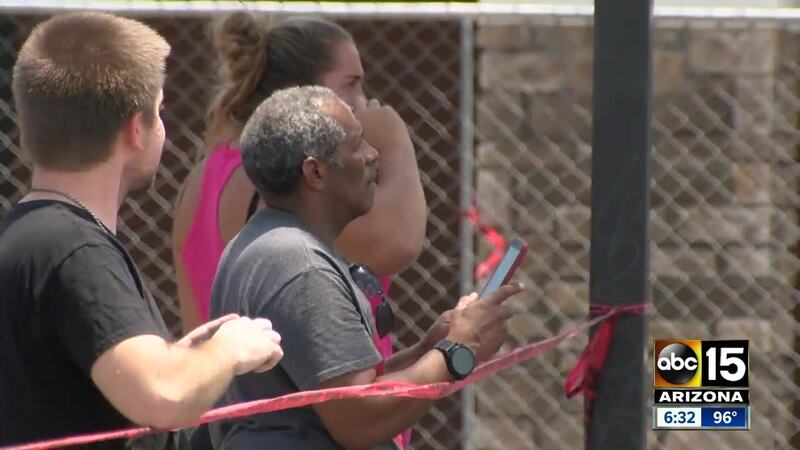 An employee of the store had reportedly called 9-1-1. 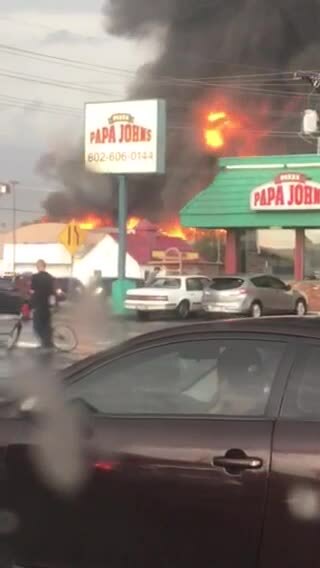 Fire officials said Thursday they believe there was a partial roof collapse near the back of the store that damaged a gas line and main electrical box, causing the fire. 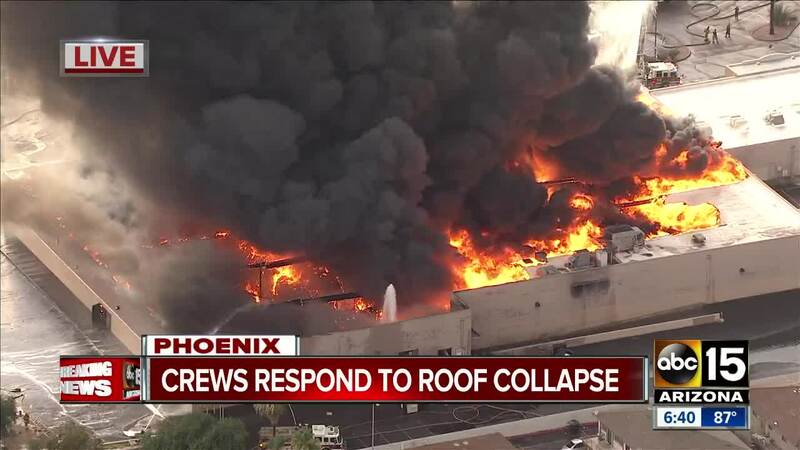 The store has a flat roof and due to the large amount of rain before the fire, it's believed the roof collapsed under the weight of the water. 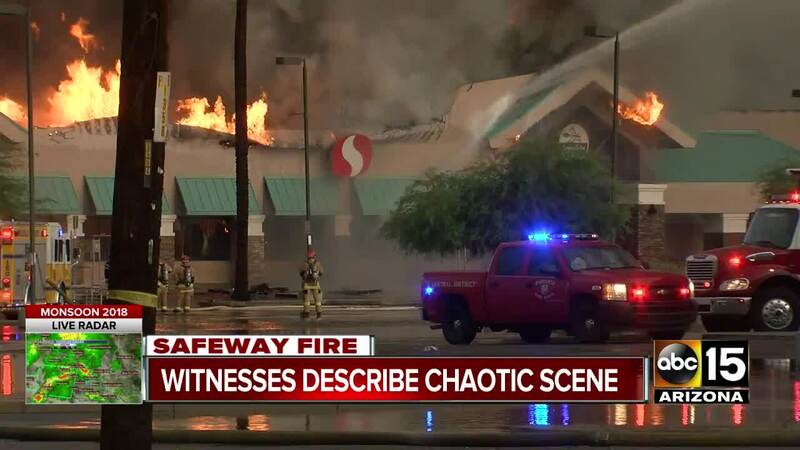 When the blaze erupted, crews made a "fast aggressive" attack on the fire and began search-and-rescue operations while they cleared the store of employees and shoppers. Video from Air15 showed huge flames and thick smoke spreading across the roof of the grocery store. Footage from Arizona Department of Transportation traffic cameras showed the plume of smoke visible from many miles away. 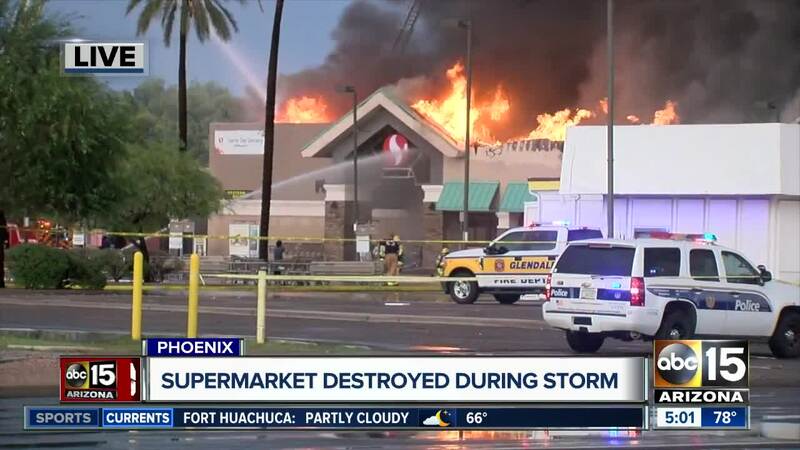 After establishing an "all clear" on scene, firefighters worked in a defensive strategy using several large water streams from ladders to fight the flames and protect surrounding businesses connected to the store. No additional businesses were affected by the fire and no injuries were reported, officials said. Firefighters remained at the scene throughout the night containing hotspots. 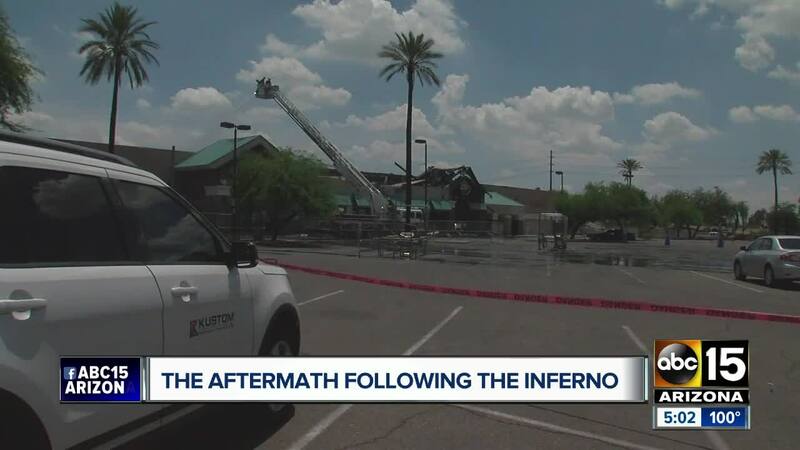 Spencer McClure tells ABC15 he was inside the Safeway as smoke started filling the back of the store. "I was trying not to panic," he said. "At the same time I was thinking, 'I think something really bad is about to happen.'" He says as many as 30 customers were inside at the time. Within minutes, there was an emergency announcement made over the intercom and employees got everyone out safely. 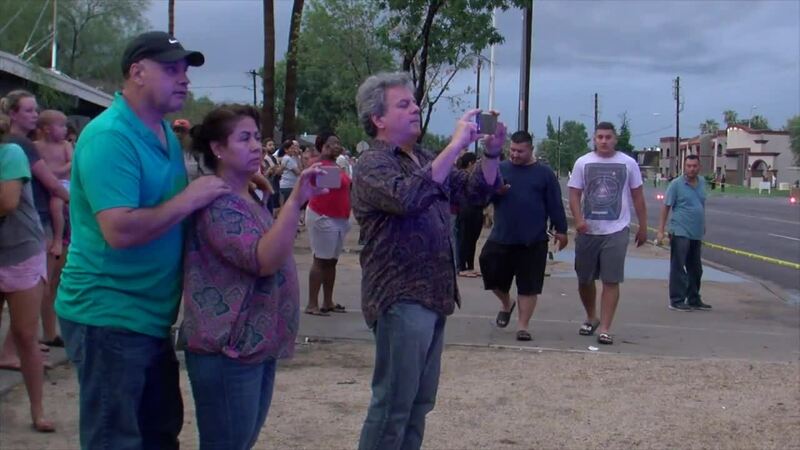 Before the blaze, he used his cell phone to record video, showing how big the rain puddles were inside, worried there could be an electrical fire. "Our heartfelt gratitude extends to the community in which we've had the privilege of serving for 37 years at this location. We are overwhelmed by the outpouring of support from our customers, vendors, employees, and community at large," says Lori Raya, President of the Southwest Division. 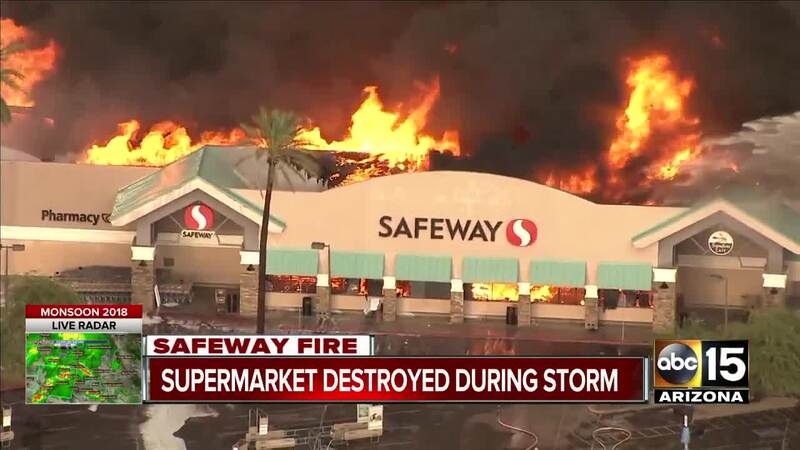 We realize that this Safeway location was the main grocery store for many residents in the area and we're exploring different options to assist residents with their shopping needs. 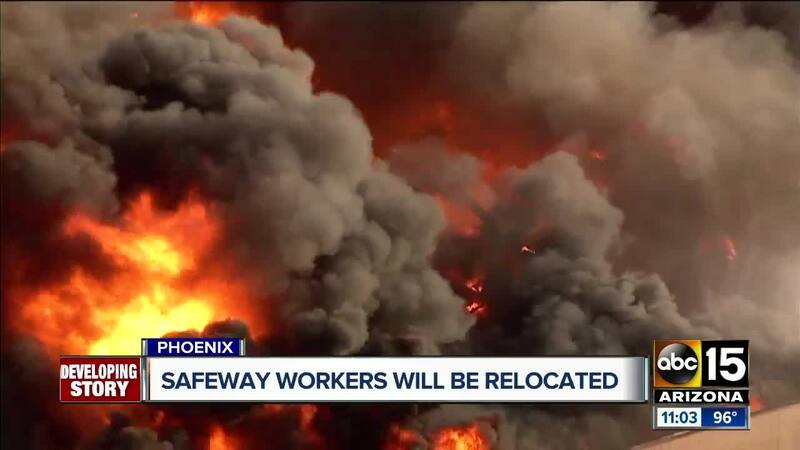 Pharmacy customers can have their prescriptions filled at any Safeway or Albertsons, including nearby locations at Safeway, 810 E. Glendale Ave. in Phoenix and Albertsons at 8035 N. 19th Ave. in Phoenix."